On August 30, Fatherly published a heartwarming story submitted by a reader that many divorced or close-to-divorced fathers—and parents in general—would likely find it is an interesting and worthwhile read. The submission chronicles the story of a father who was thrown off—or rather, immobilized—upon hearing that his wife and mother of his children wanted a divorce. As he describes, divorce especially crushed him because he himself did not have a father figure growing up, and his one goal in life was to be a good father. Below, we discuss some of the “lessons learned” from fathers who describe becoming better fathers—and sometimes even men—due to their divorce. Up front, the author directly addresses things he should have done differently in his marriage with his ex—talking more, being more affectionate, going on dates, taking vacations, each spouse putting each other first, etc., and what it was like to finally find a partner—a true connection—to share his life with after his divorce. Ultimately, he states that being divorced taught him to be a better father—to value the time he spends with his children even more—and to ultimately put family before work. The story—like many of this nature—can be sad, but also provides lessons learned that the author hopes other dads who find themselves in the same situation can learn from, the most important being that “the kids will be okay.” From kids who end up taking on parental responsibilities, or are sad, or angry, many also eventually learn how to better communicate and control their emotions after divorce if the right support is provided. 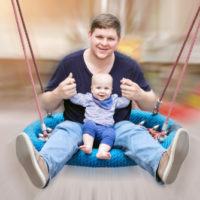 The law is also following along in the shared belief that fathers are just as important as mothers in their children’s lives: courts are more willing to grant joint legal custody, especially given that a federal study showed that men paid child support 90 percent of the time when they had joint custody and less than 45 percent of the time when the mother had sole custody. If you are contemplating divorce, speaking with a legal expert can be a first step in ensuring that you are doing everything necessary to protect yourself, your family, and their future. Contact our Florida divorce attorneys at HD Law Partners today for a free consultation to find out more.